Seeding Points for 5 games, One winner to receive flights and accom to compete in Singapore! CouchWarriors and Tough Cookie are pleased to announce that BAM6 on 9th-11th May will be an Official Qualifier for South East Asia Majors (SEAM) in Singapore on 20th-22nd June. SEAM is the biggest event in the region, attracting top level international players from around the world, and will be a Capcom Pro Tour Premier Tournament. GRAND PRIZE: The winner of Super Street Fighter 4: Arcade Edition at BAM6 will receive flights to Singapore thanks to BAM, and accommodation in Singapore thanks to SEAM. Seeding points: The above grand prize winner will also receive seeding points into the SEAM tournament brackets. In addition, while not receiving flights or accommodation, seeding points will be awarded to additional games played at BAM. So players, practice hard for Battle Arena Melbourne, because your next stop will be Singapore for SEAM! 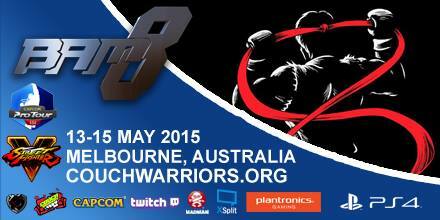 Register now for Battle Arena Melbourne 6!